First strand cDNA is useful for amplifying a particular cDNA using PCR. Gene Link provides a convenient source of high quality first strand cDNA prepared from freshly obtained tissue and appropriately frozen during transportation. APPLICATION: RT-PCR , cDNA amplification, cloning, tissue-specific gene expression, etc. Tissue-specific individual first strand cDNA is available from Gene Link. These are of high quality and lot tested for amplification of ß -actin and/or GAPDH cDNA fragments up to 1.1 kb in length. GAPDH gene and mRNA sequences showing the position of different primers. The primers (RT-PCRmerTM) were constructed to assess the quality of Gene Link Omni-cDNATM first strand cDNA. Full length and near full length cDNA will amplify the 1.1 kb cDNA fragment signifying high quality. All Omni-cDNATM lots undergo this qualification. Amplification was performed using 50 ng of Omni-cDNATM Human Pooled First Strand cDNA (Catalog No. 10-0100- 05) as the template. A 10 µl aliquot of the amplified fragment was loaded on a 1% agarose gel. The amplified fragment sizes obtained with the RT-PCRmerTM primer pair used are as follows: lane 2, F1/R1 = 109 bp; lane 3, F2/R2 = 208 bp; lane 4, F1/R2 = 505 bp and lane 5, F1/R3 = 1009 bp. APPLICATION: RT-PCR, cDNA cloning, etc. The first strand cDNA has been prepared from pooled and or amplified mRNA obtained from different tissues. These are not from cultured cell lines. The assortment of tissues vary, including lung, heart, brain, spleen, skeletal muscle, smooth muscle, ovaries, pancreas, liver and kidney. The amount supplied is sufficient for at least 50 amplifications. 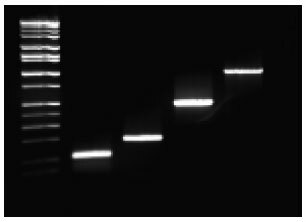 Each lot is tested for amplification of ß -actin cDNA. Omni-cDNATM pooled first strand size distribution is from ~5 kb to 200 bp. These can also be used for cloning mRNA of interest by RT-PCR. A 1.3 kb and a ~500 bp amplified cDNA fragment of p53 is shown in the figure. ß -actin amplified fragment of 289 bp. Lane 1 is molecular weight markers. 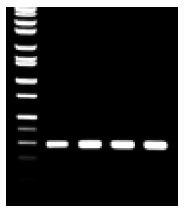 Lanes 2-5 are ß -actin control PCR product from guinea pig, human, mouse and rat pooled first strand Omni-cDNATM. An amplified fragment of 289 bp. Lane 1 is molecular weight markers. Lanes 2-6 are ß -actin control PCR products from brain, liver, intestine, skeletal muscle and spleen.